Airlines vary in size, from small domestic airlines to full-service international airlines with double decker airplanes. Airline services can be categorized as being intercontinental, domestic, regional, or international, and may be operated as scheduled services or charters. The largest airline currently[when?] is American Airlines Group. Other British competitors were quick to follow – Handley Page Transport was established in 1919 and used the company's converted wartime Type O/400 bombers with a capacity for 12 passengers, to run a London-Paris passenger service. Early European airlines tended to favor comfort – the passenger cabins were often spacious with luxurious interiors – over speed and efficiency. The relatively basic navigational capabilities of pilots at the time also meant that delays due to the weather were commonplace. In 1926, Alan Cobham surveyed a flight route from the UK to Cape Town, South Africa, following this up with another proving flight to Melbourne, Australia. Other routes to British India and the Far East were also charted and demonstrated at this time. Regular services to Cairo and Basra began in 1927 and were extended to Karachi in 1929. The London-Australia service was inaugurated in 1932 with the Handley Page HP 42 airliners. Further services were opened up to Calcutta, Rangoon, Singapore, Brisbane and Hong Kong passengers departed London on 14 March 1936 following the establishment of a branch from Penang to Hong Kong. Imperial's aircraft were small, most seating fewer than twenty passengers, and catered for the rich. Only about 50,000 passengers used Imperial Airways in the 1930s. Most passengers on intercontinental routes or on services within and between British colonies were men doing colonial administration, business or research. There has also been a trend for these national airlines themselves to be privatized such as has occurred for Aer Lingus and British Airways. Other national airlines, including Italy's Alitalia, have suffered – particularly with the rapid increase of oil prices in early 2008. TWA Douglas DC-3 in 1940. The DC-3, often regarded as one of the most influential aircraft in the history of commercial aviation, revolutionized air travel. Boeing 377 of American Export Airlines, the first airline to offer landplane flights across the North Atlantic in October 1945. 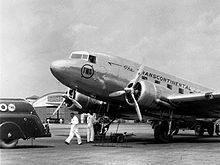 On 4 October 1958, BOAC started transatlantic flights between London Heathrow and New York Idlewild with a Comet 4, and Pan Am followed on 26 October with a B707 service between New York and Paris. The three largest major carriers and Southwest Airlines control 70% of the U.S. passenger market. In July 2016, the total weekly airline capacity was 181.1 billion Available Seat Kilometers (+6.9% compared to July 2015): 57.6bn in Asia-Pacific, 47.7bn in Europe, 46.2bn in North America, 12.2bn in Middle East, 12.0bn in Latin America and 5.4bn in Africa. Historically, air travel has survived largely through state support, whether in the form of equity or subsidies. The airline industry as a whole has made a cumulative loss during its 100-year history. In December 1991, the collapse of Pan Am, an airline often credited for shaping the international airline industry, highlighted the financial complexities faced by major airline companies. There has been continuing cost competition from low cost airlines. Many companies emulate Southwest Airlines in various respects. The lines between full-service and low-cost airlines have become blurred – e.g., with most "full service" airlines introducing baggage check fees despite Southwest not doing so. Many airlines in the U.S. and elsewhere have experienced business difficulty. U.S. airlines that have declared Chapter 11 bankruptcy since 1990 have included American Airlines, Continental Airlines (twice), Delta Air Lines, Northwest Airlines, Pan Am, United Airlines, and US Airways (twice). ^ "DELAG: The World's First Airline, using dirgibles". Airships.net. Retrieved 2010-08-22. ^ "World's First Commercial Airline | The Greatest Moments in Flight". Space.com. Retrieved 2017-10-14. ^ "History - KLM Corporate" (in Dutch). Retrieved 2017-10-14. ^ "History - Avianca Holdings S.A. - www.aviancaholdings.com". www.aviancaholdings.com. Retrieved 2017-10-14. ^ "Founders of Qantas | Qantas". www.qantas.com. Retrieved 2017-10-14. ^ "About Us | Czech Airlines". ČSA.cz. Retrieved 2017-10-14. ^ "Airline History 1903 to 1919". 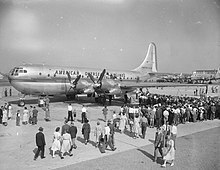 www.airlinehistory.co.uk. Retrieved 2017-10-14. ^ "World Aviation in 1919 - Part 1". Royal Air Force Museum. Archived from the original on 5 January 2011. Retrieved 28 February 2011. ^ "Koninklijke Luchtvaart Maatschappij, N.V. History". International Directory of Company Histories. 28. 1999. Retrieved 30 July 2013. ^ "History". KLM Corporate. KLM. Retrieved 30 July 2013. ^ "Aeroflot History | Aeroflot". www.aeroflot.ru. Retrieved 2017-10-14. ^ "Imperial Air Transport Company: Appointment of Government Directors". Flight. December 20, 1923. p. 760. ^ "LZ-127 Graf Zeppelin". Airships.net. Retrieved 2010-08-22. ^ "Hindenburg". Airships.net. 2009-06-10. Archived from the original on 5 October 2010. Retrieved 2010-08-22. ^ (www.dw.com), Deutsche Welle. "Alitalia Future Hinges on Rescue Package | Business | DW | 07.09.2004". DW.COM. Retrieved 2017-10-14. ^ "Tony Jannus, an enduring legacy of aviation". Tony Jannus Distinguished Aviation Society. tonyjannusaward.com. Archived from the original on 2011-07-17. Retrieved 2010-12-02. ^ "Chalks Airlines Loses Flight License". airportbusiness.com. Retrieved 2010-12-02. ^ Amick, George. "How The Airmail Got Off The Ground." American History 33.3 (1998): 48. Academic Search Premier. Web. 3 Nov. 2011. ^ "Airmail Service: It Began with Army Air Service Pilots | HistoryNet". www.historynet.com. Retrieved 2017-10-14. ^ "The Ford Trimotor and Douglas M-2 Mail Planes". Postal Museum. Retrieved July 27, 2017. ^ Martel, Gordon (2008-04-15). A Companion to International History 1900–2001. John Wiley & Sons. ISBN 9780470766293. ^ "Air Transportation: The Beginnings of Commercial Transatlantic Service". centennialofflight.net. Retrieved 2010-08-22. ^ "history of airliners 1950 to 1959". www.century-of-flight.net. Retrieved 2017-10-14. ^ "History of JAL | DC-8-32". www.jal.com. Retrieved 2017-10-14. ^ "The Boeing 747 jumbo jet changed air travel with this momentous event 47 years ago". Business Insider. Retrieved 2017-10-14. ^ "The Cold War Race to Build the Concorde". HISTORY.com. Retrieved 2017-10-14. ^ "Air Transportation: The Airline Bankruptcies of the 1980s". centennialofflight.net. Retrieved 2010-08-22. ^ "Mr. Soft Landing: Airline Industry Strategy, Service, and Safety". Apress. 2007. ^ "The American Society for Quality Debuts Quarterly Quality Report with 10-Year Analysis". American Society of Quality (ASQ). ^ "Airline Industry Overview". Massachusetts Institute of Technology. ^ Yglesias, Matthew (1 December 2011). "Air Fail". Moneybox. Slate. ^ "Budget airlines changed the world. What next?". CNN Travel. 2016-03-21. Retrieved 2017-10-14. ^ "Robert Cranall former CEO AA, CNBC". Archived from the original on 2013-04-29. ^ "Air Transportation Safety and System Stabilization Act" (PDF). Archived from the original (PDF) on 2009-04-09. Retrieved 2009-06-03. ^ a b Bamber, G.J. ; Gittell, J.H. ; Kochan, T.A. ; von Nordenflytch, A. (2009). "chapter 5". Up in the Air: How Airlines Can Improve Performance by Engaging their Employees. Cornell University Press, Ithaca. ^ "U". Dot.gov. Archived from the original on 2010-05-27. Retrieved 2010-08-22. ^ "Air Transportation Stabilization Board". Treas.gov. 2001-09-22. Archived from the original on July 9, 2008. Retrieved 2010-08-22. ^ a b Sean Broderick (May 14, 2018). "Big U.S. Airlines Seek Long-term Profitability". Aviation Week & Space Technology. ^ Horvat, William Joseph (1966). "Above the Pacific". Hawaii.gov. ISBN 978-0-8168-0000-1. Retrieved 2010-08-22. ^ Pran Nath Seth; Pran Nath Seth, Sushma Seth Bhat (2003). An Introduction To Travel And Tourism. Sterling Publishers Pvt. Ltd. p. 111. ISBN 978-81-207-2482-2. ^ S Bhatt (2007). International Environmental Law. APH Publishing. p. 175. ISBN 978-81-313-0125-8. ^ "Top 10 Airlines in Latin America By Arlene Fleming". Airtravel.about.com. 2010-06-10. Retrieved 2010-08-22. ^ "Bolivia - Transportation | history - geography". Encyclopedia Britannica. Retrieved 2017-10-14. ^ "Latin America needs more than 2,000 new passenger aircraft in next 20 years". Retrieved 3 February 2017. ^ "Too Much of a Good Thing." The Economist 26 March 2016: 23. print. ^ "Aviation: Benefits Beyond Borders" (PDF). Air Transport Action Group. October 2018. ^ "Capacity snapshot". Airline Business. Flight Global. July–August 2016. p. 78. ^ "World Airline Rankings". Flight Global. 2017. ^ "Recession 'prompts surge in cheap flights'". News.cheapflights.co.uk. 2009-05-13. Archived from the original on 2009-11-30. Retrieved 2010-08-22. ^ "2018 Global Flight Price Ranking: What's the world's cheapest airline?". rome2rio. April 16, 2018. ^ Jens Flottau, Adrian Schofield and Aaron Karp (Jun 12, 2018). "Airlines' Formula For Protecting Profits: Higher Fares". Aviation Week & Space Technology. ^ David W. Gillen; William G. Morrison; Christopher Stewart (2008-10-06). "Air Travel Demand Elasticities: Concepts, Issues and Measurement". Department of Finance Canada. ^ Robertson, David (October 29, 2008). "Virgin proposes tieup with BMI and Lufthansa". The Times. London. Retrieved April 23, 2010. ^ "The Southwest effect is". Dallas News. 2015-10-08. Retrieved 2017-10-14. ^ "Airline Operating Costs and Productivity" (PDF). ICAO. 20 February 2017. ^ a b "Gambles that haven't paid off". The Economist. ISSN 0013-0613. ^ "Seasonality: Jet2.com and Greek Islands most extreme in anna.aero leisure-legacy comparison". Airline Network News and Analysis. 1 Mar 2017. ^ Travis, David J.; Carleton, Andrew M.; Lauritsen, Ryan G (2002). "Contrails reduce daily temperature range" (PDF). Nature. 418 (6898): 601. Bibcode:2002Natur.418..601T. doi:10.1038/418601a. PMID 12167846. Archived from the original (PDF) on 2006-05-03. ^ "Climate change: Commission proposes bringing air transport into EU Emissions Trading Scheme" (Press release). EU press release. 2006-12-20. Archived from the original on 12 January 2008. Retrieved 2008-01-02. ^ "About Us » Air Transport in Europe". Archived from the original on 2013-07-24. Retrieved 2014-01-01. ^ David McCollum, Gregory Gould, and David Greene. Greenhouse Gas Emissions from Aviation and Marine Transportation: Mitigation Potential and Policies, 2009. ^ "carbon-footprint-calculator". TerraPass.com. Archived from the original on 2009-01-31. Retrieved Feb 19, 2008. ^ "environmental impact of airline flights". ecofx.org. Retrieved Apr 26, 2015. ^ "A Promising Oil Alternative: Algae Energy". The Washington Post. January 6, 2008. Retrieved April 23, 2010. ^ Ángel González (2007-08-30). "To go green in jet fuel, Boeing looks at algae". Seattle Times Newspaper. ^ "Aviation Regulation". www.hklaw.com. Retrieved 2017-10-14. 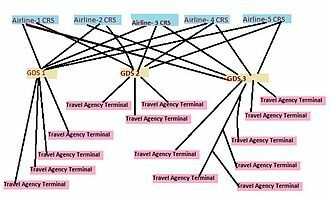 ^ "List of Government-owned and Privatized Airlines (unofficial preliminary compilation)" (PDF). ICAO. 4 July 2008. ^ "Buffett's spot-on advice". Money Sense. Retrieved 2008-10-20. "Global Aviation Markets - Analysis" (PDF). Zinnov LLC. Jan 2007. "Airline Cost Performance" (PDF). IATA. July 2006. Wikimedia Commons has media related to Airlines.